A special exhibition chronicling the history of a world famous South Tyneside shipbuilding family is being launched following the royal rededication of a newly restored war memorial. The Readhead display, which will run at The Customs House in Mill Dam, South Shields, gives an insight into the role John Readhead and Sons played in the growth of Tyneside's shipbuilding industry, their contribution to the war effort and memories of the Readhead yard before it was taken over by Swan Hunters in 1967. Striking historic images of the yard, including photos from previous royal visits, and details of some of the 57 Readhead employees who didn't return home after serving in the First World War, will form the centrepiece of the exhibition. The names of the fallen servicemen are recorded on the Readhead War Memorial, which has been restored and will be rededicated at Harton Quays Park, South Shields riverside, during a special Service of Rededication on Thursday 23 October. During the ceremony, His Royal Highness The Duke of Kent will lay a laurel wreath at the foot of the Readhead War Memorial before being escorted into The Customs House to see the exhibition displayed in The Port of Tyne Gallery. The free exhibition will remain in place for the public to view until it is moved to Central Library South Shields next month. Councillor Ed Malcolm, South Tyneside's Armed Forces Champion, said: "We have a rich and proud history of shipbuilding here in South Tyneside. The Readheads yard played a key role in the growth of this industry, helping to bring wealth and fame to our region. "The ships that were built here sailed the world, and with Readhead's employing generations of families, there are many people today who have links to the yard. "This new exhibition gives a fascinating insight into Readhead's shipyard, the family and the poignant story behind the Readhead War Memorial, which honours those local Readhead workers who fought for their country during the Great War. "We look forward to welcoming His Royal Highness The Duke of Kent for the rededication service and inviting him to see this special display in The Customs House." The exhibition has been organised by South Tyneside Council in partnership with The Customs House and South Shields Museum & Art Gallery. Customs House Executive Director Ray Spencer MBE said: "We are honoured to welcome His Royal Highness to The Customs House to rededicate this lasting legacy to a generation that gave up their lives for our future generations. The exhibition reflects our rich shipbuilding heritage which is long overdue a permanent memorial." Geoff Woodward, Manager of South Shields Museum & Art Gallery, said: "Tyne and Wear Archives and Museums is delighted to be working in partnership with South Tyneside Council and The Customs House on this special exhibition. Readhead's has a significant place in the heritage of South Shields and the rededication of the War Memorial provides a fitting time to look back at the fascinating story of the shipyard." HRH The Duke of Kent will be accompanied on his visit by Her Majesty's Lord Lieutenant for Tyne and Wear, Sir Nigel Sherlock. The rededication event will also be attended by members of the South Tyneside Armed Forces community including local military units and veterans' organisations, as well as descendants of some of the men recorded on the memorial and the last surviving members of the Readhead family. Rodney Towers, son of the last Chairman and Managing Director of John Readhead and Sons, said: "I have been very impressed with the initiative of South Tyneside Council by their decision to relocate the Readhead Shipyard War Memorial. This was a personal tribute by my great grandfather and I'm delighted that South Tyneside Council has chosen to honour it in this way. "South Tyneside Council has also demonstrated its excellent research abilities in the way it has pulled together some of the personal histories of those men listed on the memorial and which can be seen at the exhibition. "I think all these South Tyneside Council activities do help to keep alive the history of South Shields which is important for future generations. I'm delighted that the rededication will be honoured as a royal event." Readhead's shipyard was founded in 1865 by John Readhead. The Readhead War Memorial was originally unveiled in November 1921 by James Readhead in honour of his employees who did not return home from the war. 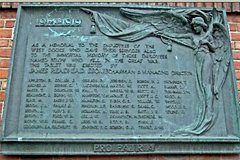 After the shipyard was taken over by Swan Hunters in 1967, the war memorial was left without maintenance for many years before being salvaged from the former yard in 1999 and placed near the former Readheads entrance on the wall facing Commercial Road. Andrew Moffat, Port of Tyne Chief Executive Officer, said: "The Readheads memorial is highly regarded in the community and we are delighted to see a new permanent home for this significant piece of South Shields history." Arranged by the South Tyneside Armed Forces Forum, the rededication service will include prayers led by Father Chris Fuller of St Hilda's Church and a blessing from Reverend Paul Kennedy of St Michael and All Angels Church. It will also involve the Durham Light Infantry Association buglers and a piper from 101 Northumbrian Regiment, Royal Artillery. The restoration and rededication of the Readhead War Memorial and exhibition coincides with the 100th anniversary of the outbreak of the First World War, which claimed the lives of more than 2,000 men from the old borough of South Shields.